The 2008 Midwest Women's Mountain Bike clinic began with a splash, or more like a downpour! With over 10 inches of rain the night before the clinic, trails were drenched and the clinic had to be postponed. For those who arrived on Friday evening, we still had a wonderful time sitting around the campsite laughing and eating plenty of food. Most of southen Indiana was flooded for weeks and several of us were actually flooded inside the park for the weekend, but believe it or not the trails at Brown County were completely ridable by Sunday afternoon. The clinic was rescheduled for later in July. Unfortunatly the date change meant we missed out on some of the demo bikes, but we had a fantastic turnout of ladies and volunteers. Participants ranging in age from 14 to 65 arrived from all over Indiana as well as Ohio, Kentucky, Michigan and Illinios. This year we added several new aspects to the clinic such as the Trail Education Class. Participants learned about trail advocacy and what goes into getting access to the trails we ride. They were also able to see first hand new trails being built by HMBA volunteers. 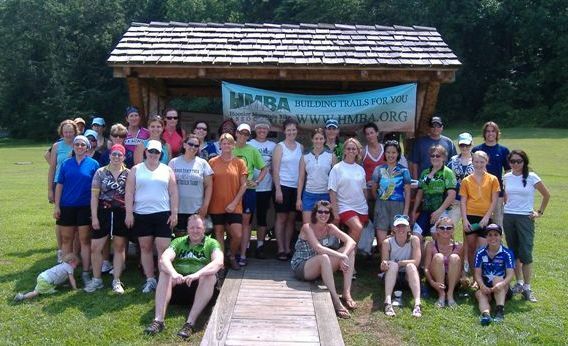 Check out what participants had to say about the Trail Education Class. We also added the Naked Lady Party which allowed for new riders to select items donated by other participants and volunteers. We had everything from helmets, gloves, shoes, jerseys and more. This will surely be an ongoing tradition at future clinics. We look forward to seeing many new and returning faces for the 2009 Midwest Women's Mountain Bike Clinic! 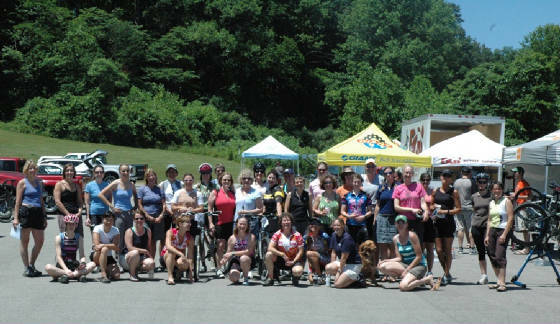 Thank you to everyone who made the 2007 Midwest Women's Mountain Bike Clinic a huge success. We have nearly 50 participats, instructors and volunteers riding the trails at Brown County State Park. Participants learned new skills and gained confidence by riding with some of the best female mountain bikers in the Midwest! Thank you to the Dirty Divas (Suzanne, K.D., Kathy and Rachel) and local instructors (Alexe, Deanna, Nita and Melody) for coming out and volunteering their time to teach a fantastic group of women! The weather was absolutely perfect and the trails were even better. Participants travelled from all over Indiana, Ohio, Kentucky and Illinios to take advantage of the day. Groups ranging from First Timers to Advanced riders were able to test their skills on some of the best trails around. Every person came off the trail smiling with lots of great stories to tell! The expo featured a HUGE selection of women specific bikes. Ladies were able to test ride bikes from Trek, Cannondale, Giant, Rocky Mountain, Iron Horse, Yeti and GT. Free fitting sessions were offered through out the afternoon courtesy of Nebo Ridge Bicycles. The expo also featured several lectures and tire changing races. Congrats to Dana Bland of Shepardsville, KY for winning the tire changing races sponsord by Reser Bicycle Outfitters (Newport, Ky). Thank you to all of our sponsors: Hoosier Mountain Bike Association, Nebo Ridge Bicycles, Bicycle Garage Indy, A1 Cyclery, Revolution Bike & Bean, The Bicycle Station, Reser Bicycle Outfitters, DINO, Trek, Cannondale, Giant, Oakley, Sundance SalanSpa and Evomo.